This summer vacation of 2018 was full of adventures. This story is written in a chronological order for the purpose to describe a maximum number of impressions. We found quite cheap flights from Moscow to Paris. The price of the return ticket from Polish low-cost aircraft company LOT was only 170 euros. But it had a transit stop in Warsaw. Because it was a night stop, we booked not expensive rooms in Sangate Hotel Airport. It takes 20 minutes from the hotel to Warsaw's airport. We booked an Uber taxi. Payment for the taxi was written off immediately after we completed the order. We were standing in front of the hotel but the taxi driver didn't come. Happily, we were able to see his car on the navigator and we found him on the side street near the hotel. We concluded that the drivers in Warsaw didn't care where they picked up passengers. There was a disorder when we stayed inside the terminal in airport Charles de Gaulle (CDG). Security service closed all exits. Nobody understood what happened. We had to stay there for about one hour before it was allowed to leave the airport. The buses from airports in Paris in contrast to other cities are more expensive than for local trains. Because we bought tickets for a group of four people, we had a discount in comparison with buying tickets separately. 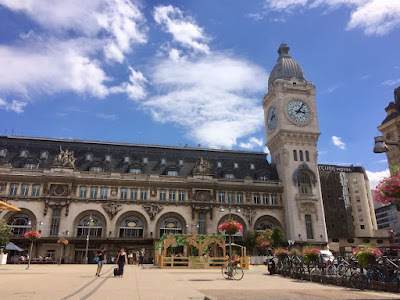 Our final destination in Paris was the train station Gare de Lyon. The area around is not interesting. The only beautiful building was the train station. The hall at the restaurant Le Train Bleu is very remarkable for sightseeing inside the train station. There are several devices in the train station where we can print the tickets using the reference number. It is necessary to validate the tickets. The trains in France are delayed constantly. We faced this first on Gare de Lyon. The passengers crowded in the small area before the trains. While waiting I dedicated this time to observe people. They came from very different parts of the worlds. 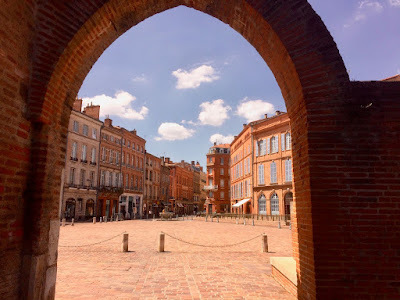 Our final destination was the city - Bezier which is located in the South of France. The train goes about four hours through Southern cities Nimes, Montpellier, Agde, Sete. It was not the optimal way. It's better to fly to Montpellier or to Spanish city Girona and from there to start the journey by train. We booked the Hotel California in Beziers. It was a forced choice because we booked it two days before the summer vacation. 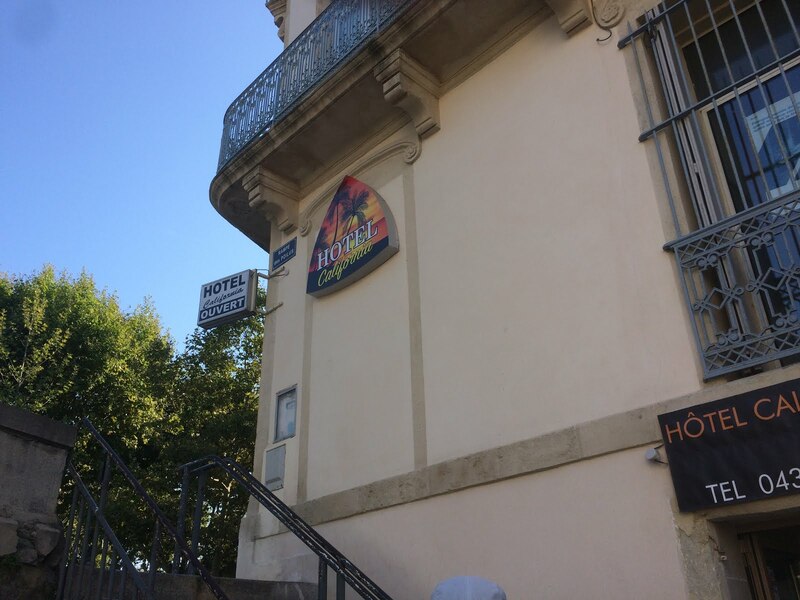 We tried to find a hotel in Valras-Plage or in Beziers. There were very few vacant bookings for more or less appropriate price. The time in Hotel California was like a living in 18-19 century. The hotel is located on the slope of the hill, the numbers of the floors started from top to bottom. The rooms are very small. Some of them are without windows. Happily, we lived in the rooms with two windows in each. Without air-conditioner (with the only ventilator) in the rooms and without windows the life would be unbearable. Other signs of living in the medieval conditionals are an absence of cupboard, electric teapot (instead of it - microwaves). Also, our time was restricted when we were using the kitchen and refrigerator. There are also some advantages of this hotel. First of all it is a very good location in the central square of the city. The square is connected with the most popular street - Alley Paul Riquet. It was very important for us that the bus station and train station are close to the hotel. The restaurants usually prepared for dinner at 7 pm. For buying food the shop Casino is a good choice. The next benefit is a very friendly staff. They advised good places for visiting and how to reach them, gave us the tickets to the Wine Festival, and a bottle of wine "Languedoc" (the name of this province in France). 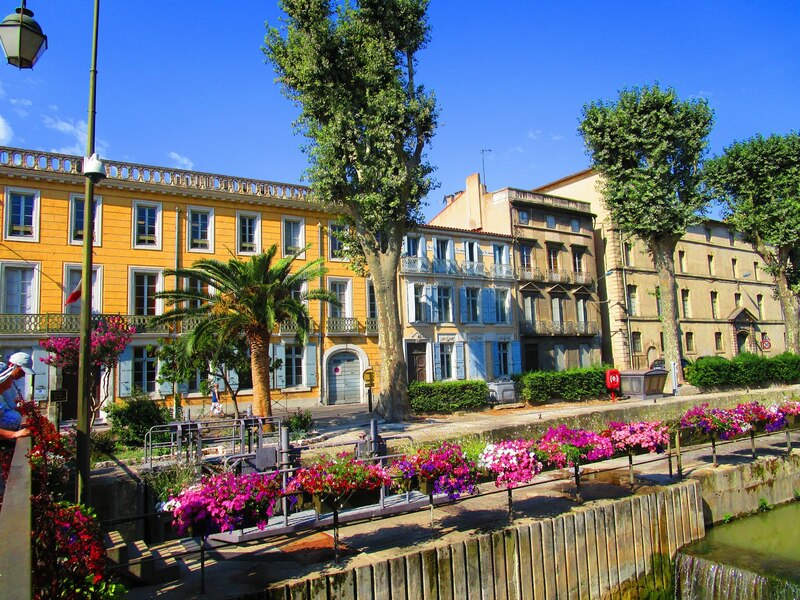 Beziers is located on the west-south of France, not far away from French-Spanish border in the region Languedoc-Roussillon. 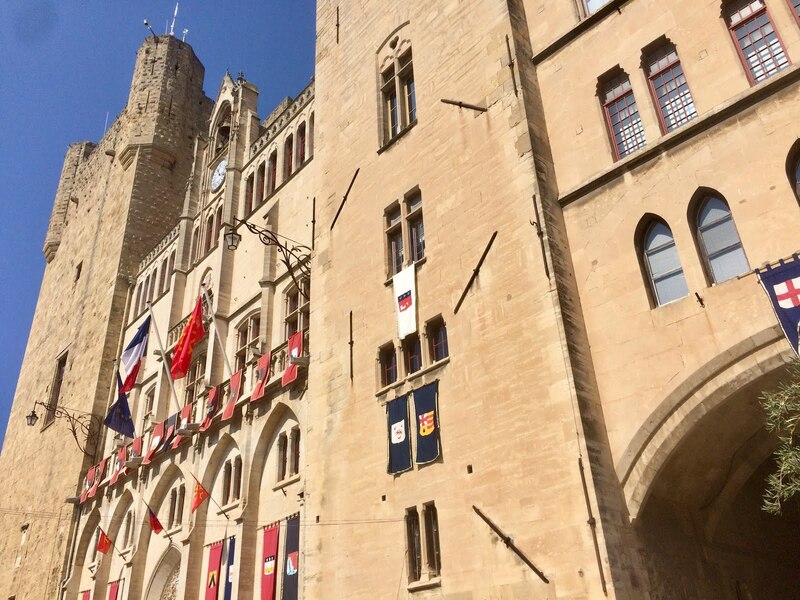 There are almost no foreigners in Beziers, the majority of visitors are French. The region is developing, not well-known for international tourism. The beaches are located in Valras-Plage. It takes 40 minutes to reach them at Beziers. The journey is not tiresome. During the ride, we observed beautiful landscapes around. The tickets for the bus are very cheap. The price for a card with 10 tickets was only 3 euro plus 1 euro for the card. Valras-Plage is a small town with a very wide sandy strip. Water in the sea was much colder than we expected. In the morning before the main crowd came the water in the sea was clean. The beaches are public. There are very few points for renting beach beds, but it is extremely expensive. Their price for a day was 13 euros for a person, 10 euros for a half day. The majority of people use their own umbrellas for protection from the sun's rays. Public toilets are free but they are located far away from each other on the long hinterland. There are very few showers on the beach but they don't work from 1 pm to 4 pm. There are a lot of people on the beach in August. Almost all of them are French. A few people speak English in the area of the Languedoc-Roussillon. There is a market in Valras-Plage with cheap seafood, one oyster costs about 70 cents. Tourists can buy oysters and ask sellers to open them and pack with a piece of lemon. We bought two umbrellas for 15 euros each with plastic drilling facilities for 5 euros. After that, we had been using them on the beach. 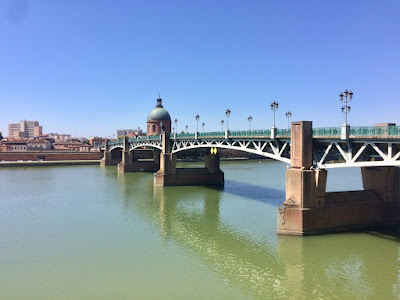 We had a journey to Narbonne. We bought quite expensive tickets. Only during the next ride, we discovered the cheapest way to buy tickets for the train is to use discounts for children and young adults. It took only 20 minutes to reach this city from Beziers. Narbonne left us with good impressions. We took pictures on the small bridge with flowers. 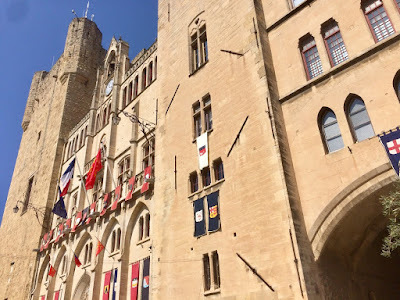 Tourist can enjoy walking through the medieval streets, visiting a magnificent Cathedral, where the altar is recognized as the oldest and romantic in France. 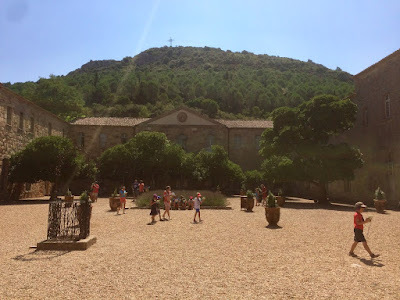 We followed advice from the guidebook for tourists and visited Fontfroide Abbey. There is no regular transport from Narbonne to Abbey except taxi. The manager of the tourist office called us a taxi with a fixed price of 40 euros for four people. Because of not developing a tourist industry, tourists who reached this place can enjoy walking there without a crowd. We came back to Narbonne and we searched the river which we saw on the map. To our surprise, we didn't find it. As it appeared, the river was hidden under the pavement. 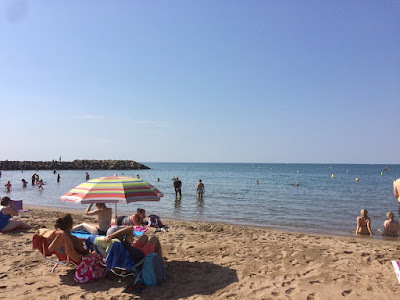 We spent our time on the beach in Valras-Plage. In the evening we participated in the Wine Festival in Beziers. The receptionist at our hotel gave us three tickets for three glasses of wine. There were lots of desks on Alley Paul Riquet. Each farmer organized the separate desk where visitors could try a glass of vine. The cost of the glass with three tickets was 5 euros. The festival of wine that day was finished on the square with color fountains. These fountains are very popular among locals, children like playing with water, they were screaming and, running under streams of water. Journey to Toulouse gave us lots of positive emotions. We liked this city from at first sight. There are two main colors which defer to this city: pink and violet. It has an explanation. There are pink stones in this region and many buildings were built with this stones. There are many fields around the city where violets cultivate. These flowers use in the perfume industry and in many other areas. For example, there are a lot of brands of tea made from violets. We took a few pictures during the walk on the embankment along the river but we didn't cross the river. As usual, our train was delayed. General impression about Toulouse was very positive. The city is very beautiful. We decided to dedicate half the day to exploring Bezier. Bezier is an ancient city. There are many historical sightseeings such as Roman Arena, medieval streets, castle, port but it is not easy to find them. As I mentioned the touristic industry in this region isn't developed. No guide sights on the streets. The picture of Saint-Nazaire cathedral presents Bezier in touristic guidebooks. There are not enough restaurants with appropriate prices in Beziers. It was difficult for us to find a place for dinner in the evening. We spent the second part of the day on the beach in Valras-Plage. We witnessed a strong wind and sandy storm followed. The strong and short rain caught us near the beach. When the rain was over we spent some time on the river which flows into the sea. Going on the small pier was like a game for us because the pier was swaying. Each-evening routine to find a good restaurant was finished with success, we found a good place for supper on the place Le Trois Six across Hotel de Ville (it is a building of city administration- not only for Bezier and in Paris). It was nice to have dinner there, around very nice buildings with beautiful French balconies. Together with an ordinary meal, we ordered foie gras. The weather the next day was sunny and we had a good day at the beach. We bought from the market four oysters for three euros. The seller opened them for us, added lemon and packed. The price is much less than in other places. The market is open only until lunchtime. Next morning we spent a definite time searching the port on the canal in Beziers. Canal du Midi is very important sight which is included in the listing of UNESCO. The ideation of this canal is by Paul Riquet. There are many sculptures of his and many streets and so on named after him in this region. We came to the port at 9 am, passengers of the barge were already there, they booked the tickets in advance. 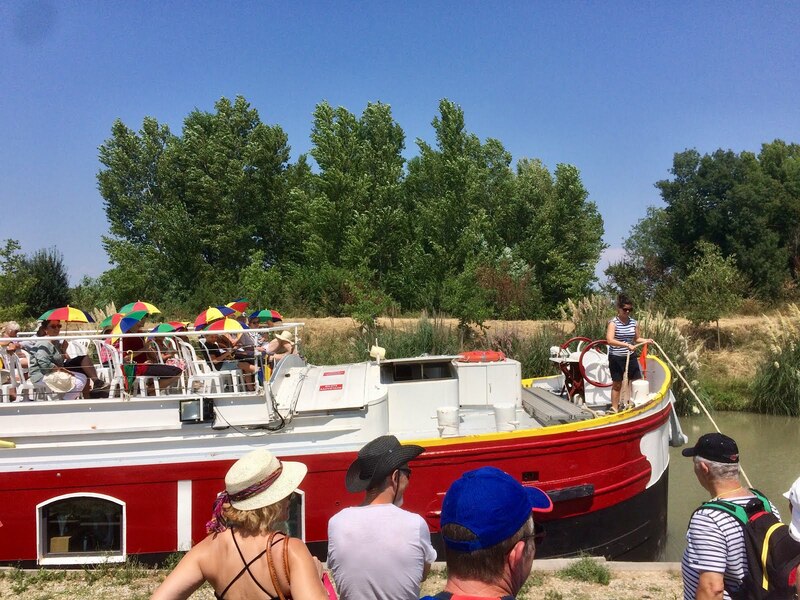 There were two options: to buy tickets for all-day-trip with a dinner on the barge or to ride to the village Colombiers, staying there till the time the barge comes back. We chose the second option. The price was 34 euros for each ticket. Our barge went through several locks. It took much time. The barge moved very slowly, we came across a few yachts with people (families or group of friends) who selected that kind of journey. It was a very hot day. The passengers had only umbrellas for protection from the sun's rays. 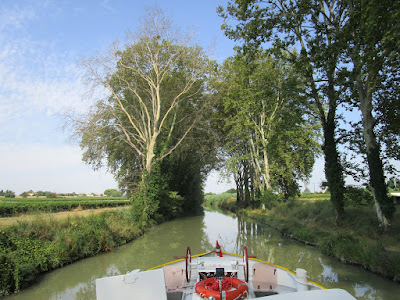 The canal is surrounded by the trees, vineyards, fields. We took the pictures on the deck and when the temperature of the air became extremely high, we hid in the lower deck. The village Colombiers didn't impress us. We took some photos on a field near the village. During the siesta, the only shop was closed. We had lunch and in the afternoon we were picked up by our barge which was returning to Beziers. That evening in Beziers, we ordered in the restaurant a meal "tartare". As it appeared it was a completely raw meat. This is a very popular dish among the French but we were not ready to expose our stomach to it. 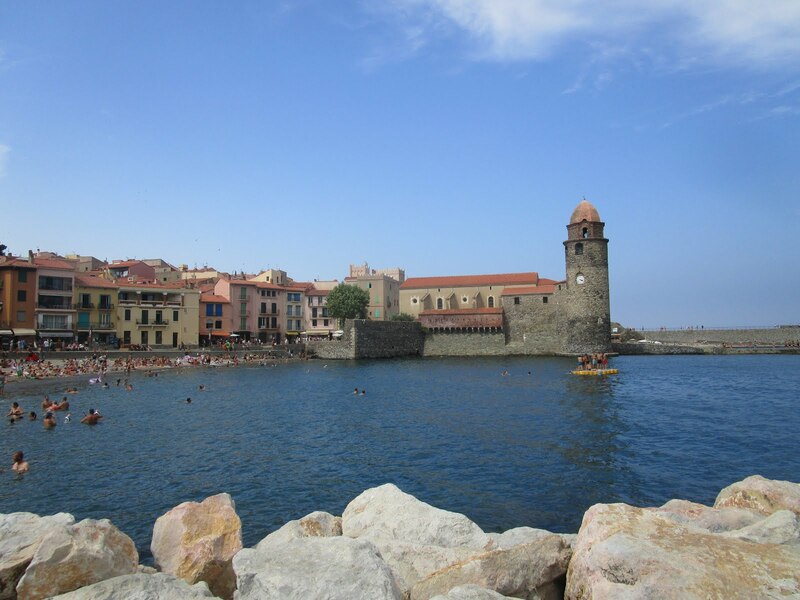 On the last day in the South of France, we had a trip to Perpignan. This city is located close to French-Spanish border. We saw there bright colored buildings with Catalonian flags on the balconies, many palms. We faced some difficulties in finding the touristic office. The map which we took in the tourist office wasn't good, it was almost useless. Using navigator on the smartphone, we had a long way to the palace of the kings of Majorca. The palace is extremely huge. We paid for the entrance of four euros for each ticket and we were very disappointed because there was nothing interesting inside. In the afternoon, we visited a very beautiful town Collioure. We saw there the beaches surrounded by hills, castle, docks, the streets full of flowers, lots of tourists and the shops with paintings. The sea there is much warmer than in Valras-Plage. The beaches are with pebbles, full of holidaymakers. The next day we left the hotel. We were presented with a bottle of wine “Languedoc” from Hotel California. On the way back to Paris we enjoyed seeing the beautiful landscapes through the windows of our train. We went through the Saint Lazare train station where we saw two funny monuments- with suitcases and clocks. 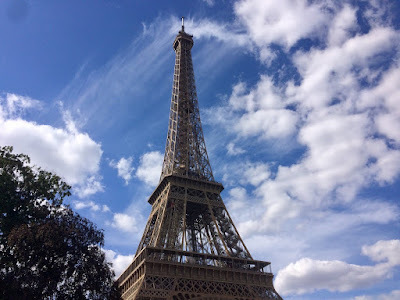 We chose to stay in Hotel Darcet in Paris which is very beautiful and not so expensive. The hotel is located on the Boulevard de Clichy in Montmartre (Parisian district). The hotel offers tea and coffee, access to the kitchen and refrigerator without additional payments. There is a nice boulangerie where we bought baguette each morning and a supermarket Auchan. This evening we had a supper where we ordered an exotic food - frog legs. It was our first evening in Paris and we decided to visit the symbol of the city- the Eiffel Tower. We bought the tickets for the metro, carnet - which is the ticket for ten rides (it is cheaper than buying the ticket for one ride). Metro in Paris is quite convenient because of a great number of the stations. But also many stations are under reconstruction, it seems that they have been staying in the disorder long time. - Russian “spiritual and cultural center” near the Eiffel Tower. 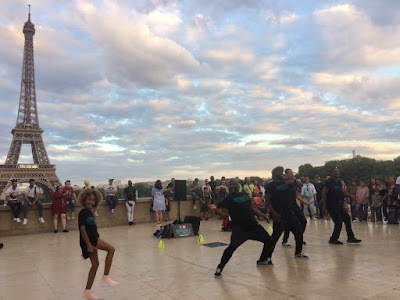 On the opposite side of the river Seine, we saw a nice concert with street musicians. We were very impressed by the play of a young girl. We proposed that if the movies or music producer was in the crowd, she would become a star. Eiffel Tower as a background added positive emotions of this concert. Our first full day in Paris was rainy. We bought umbrellas on the Avenue des Champs-Élysées, raincoats near Louvre. 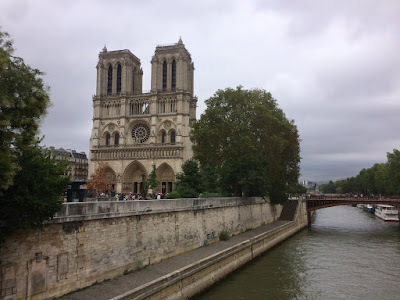 We went through embankments and reached Notre-Dame de Paris. We spent a couple hours in Jardin du Luxembourg taking lots of pictures and walked on the streets. We found on the Internet the information about the possibility to visit a good point on the 9th floor in the Arab World Institute. We observed a large part of the Parisian center without any payments for it. 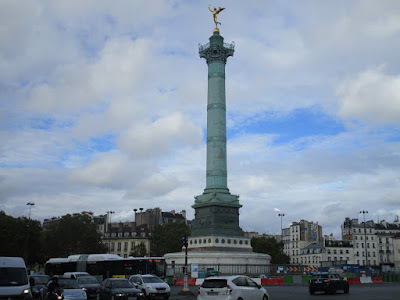 On the way back to the hotel, we went through Boulevard Saint-Germain well known as an area where Russian immigrants lived after the Russian revolution and the Place de la Bastille. The big part of the day we were in Versailles. We didn't buy tickets to the palace, we were in the park. It occupies a huge territory, one day is not enough to see all parts of the park's ensemble. 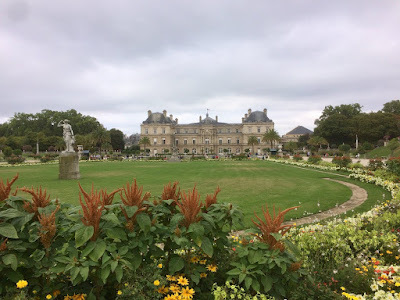 We discussed the fate of Marie Antoinette for whom was built two separate palaces in Versailles and who was executed during the French Revolution. We bought the additional tickets for visiting Marie Antoinette's area and explored the artificial village which was built for her. In the last evening in Paris we visited the church Sacré-Cœur and through the streets of Montmartre, we came back to the hotel. The McDonald's near our hotel where we had a quick supper was the worst McDonald's which I have ever visited: dirty and expensive. This summer vacation was full of advantages. 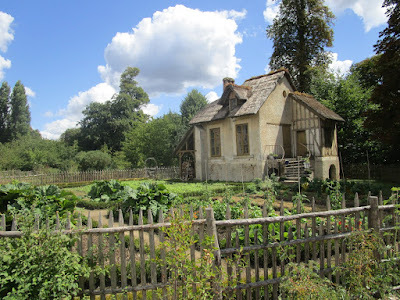 We wanted to see authentic France (as it is) and we were in the region with no foreigners. We came back home a little bit tired physically (we had not many days for lying under the sun), but we relaxed mentally. This trip was a good opportunity to explore a great and beautiful country - France.